Launch of our numeracy programme! Did you know that 38% of students don’t progress in numeracy during their first year of secondary school? For this reason, and thanks to support from Nesta’s Maths Mission team, Tata Group, and Tata Limited, we are pleased to announce the development of a brand new numeracy curriculum for our year-long peer mentoring programmes. Built around the latest in evidence-based research, our programme focuses on the mastery of number using a cognitive load approach. With success in piloting the programme across three schools (preliminary impact results are promising…see p. 19 of this report! ), we are gearing up to roll this out to more schools in 2019. 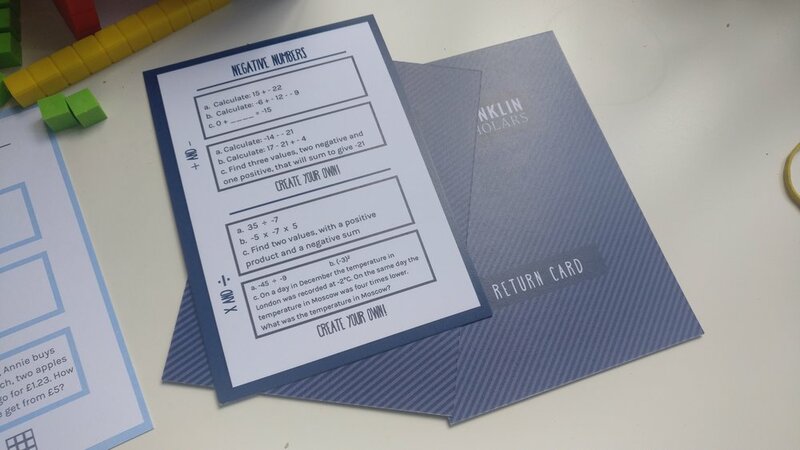 Similar to our existing literacy programmes, our numeracy programme involves the recruitment and training of older students (called Franklin Scholars) who then provide year-long programmes of support to boost, strengthen and stretch younger pupils vulnerable to dips in progress. Our rigorous programmes challenge and equip the Franklin Scholars to lead weekly workshops for younger pupils. While the Franklin Scholars help their mentees boost academic skills and develop the resilience to tackle the challenges that lie ahead, they themselves develop a sense of purpose, self-worth and responsibility. Interested in finding out more? Check out our programmes page, get more information on our impact, and contact us for a chat!